For me I want to build a big business, my goal is to get to $100k a month online. 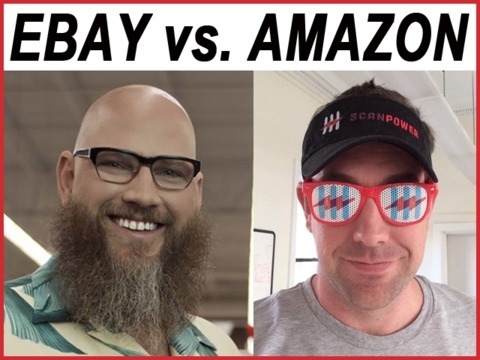 Based on my research the best platform to do that on is Amazon, here’s why. In my experience ebay is great if you are selling second hand things you own, remember that it was started to bring garage sales online, and it does that very well. However it’s a garage sale, prices are lower, people go there expecting a bargain. Amazon however is a shopping site where people sell brand new goods, that’s what Amazon is known for. This is much much better because the average dollar value you can expect is so much higher. If you want to set yourself free, you need higher dollar values. 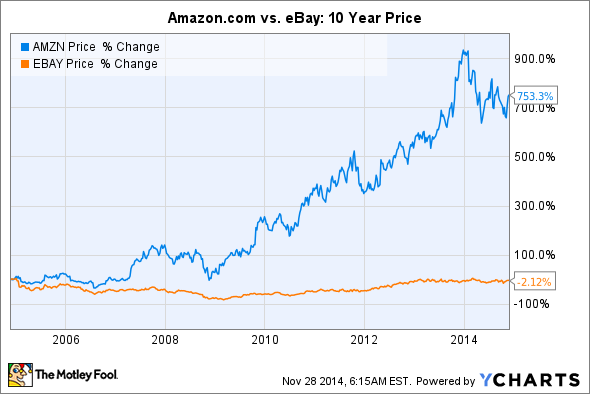 The chart clearly shows Amazon is on the way up and ebay is on the way out. It’s MUCH easier to make money when a company is on the way up. When a company is in decline all the easy money has been made. and the evidence backs up that ebay is on the way down. They have continually gouged their sellers with higher fees. and when the “Big” players realised that their partners, friends, associates etc (the ordinary members) no longer wanted to accompany them to this club …. So for me if you’re thinking of selling online you should take a look at the facts and choose your platform carefully. One will help you the other will make things very hard for you. P.S want to ride the wave of Amazons Success here in Australia? Then join me as an Aussie Online Entrepreneur!